Some cars are just “cooler” than others and the 2013 Hyundai Veloster and Veloster Turbo have a cool factor that can’t be beat. When people see the Veloster for the first time, it turns heads and gets them talking. Hyundai is producing fun cars and the new Veloster is certainly the kind of car that is a bit unconventional in it’s styling. But that’s not the only reason KBB found the three-door car to be the “coolest car under 18K. To attract a new generation of buyers, automakers must deliver something unique. And Hyundai has done that with the new Veloster. KBB used two criteria to determine each vehicle’s “cool factor.” They had to be fun-to-drive and fun-to-own. In the 18K or less category, the 2013 Veloster took the top spot. That’s exactly what Hyundai Motor Group had in mind when they designed the Veloster in 2012 and they delivered in a big way. Younger buyers are also looking for performance, and Hyundau unveiled the new all-new turbo model that is sporty and fast. The Veloster Turbo features a new 1.6-liter, 201 horsepower, direct-injected twin-scroll turbocharged engine, aggressive bodykit and unique 18-inch alloy wheels that set it a apart. The Veloster Turbo is selling well and Hyundai keeps connected with younger buyers with a series of Re:Mix Lab events they rolled out across the nation. Hyundai Re:Mix Lab is an event series all about culture, music, art, technology, and of course, the Hyundai Veloster, Genesis Coupe and Elantra Coupe. Veloster also just recently was awarded the top performing vehicle in the AutoPacific Vehicle Satisfaction Awards along with the 2013 Genesis Coupe. Hyundai is moving in the right direction and the 2013 Hyundai Genesis Coupe and 2013 Veloster topped the Aspirational Luxury Car and Sporty Car categories respectively in the 2013 AutoPacific Vehicle Satisfaction Awards for 2013. Hyundai has certainly come a long way from where they started with the poor quality and unreliable Hyundai Excel in 1986. 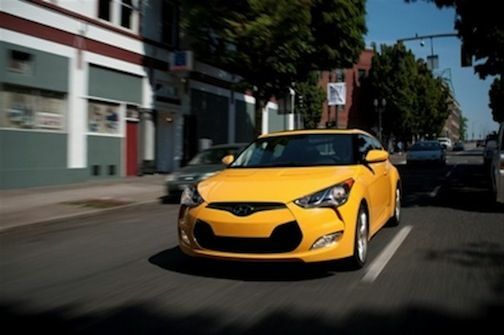 The 2013 Hyundai Veloster and Veloster Turbo are not only the coolest cars under 18K on the planet, but they are now tops in customer satisfaction.